engine is a carnot engine. 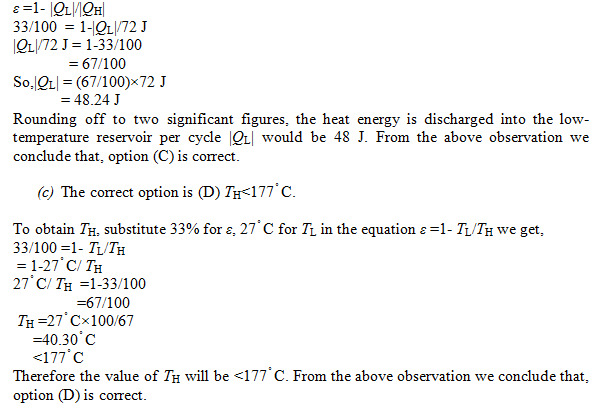 (b) How much heat energy is discharged into the low temperature reservoir per cycle? (E) the question can be answered only if the engine is a carnot engine. 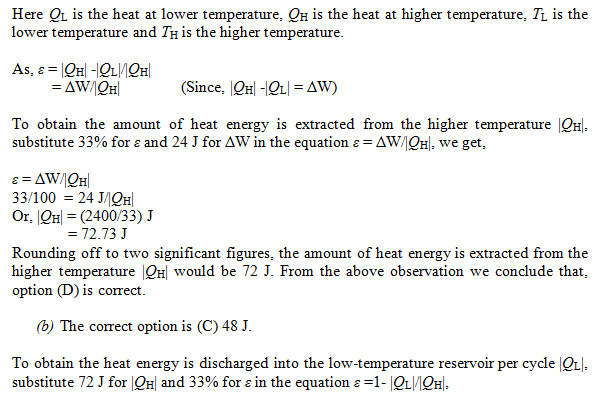 (c) For this engine TL = 27ºC. What can be concluded about TH? (a) The correct option is (D) 72 J. As the formula of efficiency is only applicable to Carnot engines and as this is a real engine the first two questions cannot be answered. Thus  option E for both.If it were a Carnot`s engine, then TH would have been 177°C . Considering a Carnot`s engine having The as 177 C would give efficiency of 33% but as this is a real engine its efficiency must be less than 33%. Hence if it is 33% then it`s TH must be greater than 177°C. The answer for first two can be given by the formula e= W/Qh1/3= 24/QhQh=72J1/3=1-Ql/QhQl= 48JPardon my previous answer was wrong.The third part is pretty much fine. in osmosis why does solvent flow from dilute to concentrated part? of the solution?